Andrew: After a slow start, Lenny Floyd has become a stud and McPhee has been productive with four sacks. 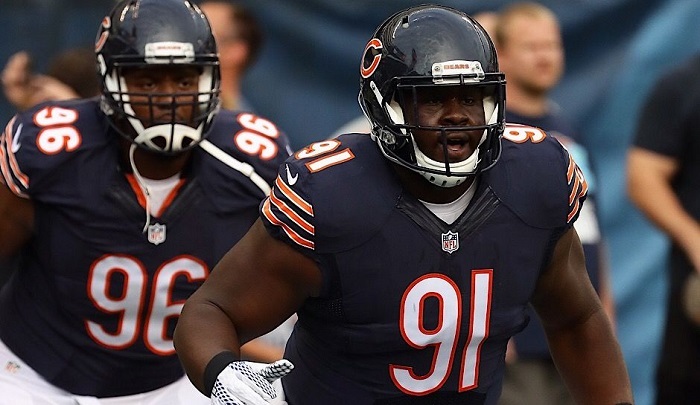 Data: Leonard Floyd is finally waking up and Pernell McPhee has surprised with his effectiveness in short spurts but will we see more of Isaiah Irving in the 2nd half? Jeff: This has been the most pleasantly surprising group on the roster, headlined by a borderline All-Pro campaign from Kyle Fuller and steady work on the other side by Prince Amukamara (when he’s been healthy). Andrew: Kyle Fuller and Prince Amukamara are showing why they were first round picks, while Marcus Cooper and Bryce Callahan have both given the team solid contributions. Data: I said throughout the off-season that Kyle Fuller was the best CB on Chicago’s roster, but I never expected this level of play out of him. Jeff: Eddie Jackson and Adrian Amos may be the second coming of Mike Brown and Tony Parrish as they’ve shown flashes of stabilizing what has been an unstable positions for the Bears in recent memory. Andrew: Eddie Jackson has a lot of range and ball skills that have, apparently rubbed off on Adrian Amos, who won’t be giving his job back to Quintin Demps. Data: Eddie Jackson has fixed both safety positions for the Bears by allowing Adrian Amos to play to his strengths next to a true center fielder. Jeff: John Fox, Vic Fangio and secondary coach Ed Donatell are finally coaching players up, which is something I’ve been desperate to see since they arrived. Andrew: Vic Fangio is dialing up the right game plans but that isn’t hard to do with the players he has. Data: The coaches have the defense playing with an attitude and looking to make plays instead of just avoid giving them up.